I love the cinema. The allure of the darkness, of being totally drawn into a story with no multi-tasking allowed. I am not sure quite why, but I always believed you needed a companion for the cinema. Someone to share popcorn with and chat. That is fun, but I have found it isn’t a necessity. There is something quite indulgent about taking yourself to the cinema. Choosing the movie that you want to see, selecting your snack and drink and allowing yourself the luxury of a couple of hours in darkness where you are totally engrossed. This solo movie thing has become a bit of a quiet addiction. I drive past the Eye Cinema in Galway (my favourite haunt) I am tempted to pull in just to see what is on. Finding your Feet – a wonderful romantic comedy featuring Celia Imrie, Imelda Staunton and Joanna Lumley gave me so much delight. It lifted my spirits and when it was over – I took myself off to the 5-star g Hotel for a solo cappuccino. I was getting the hang of this. I have lots of friends and a wonderful partner, but I am now a firm believer in flying solo at the cinema. I like the 3pm time slot which seems to feature my kind of movie. 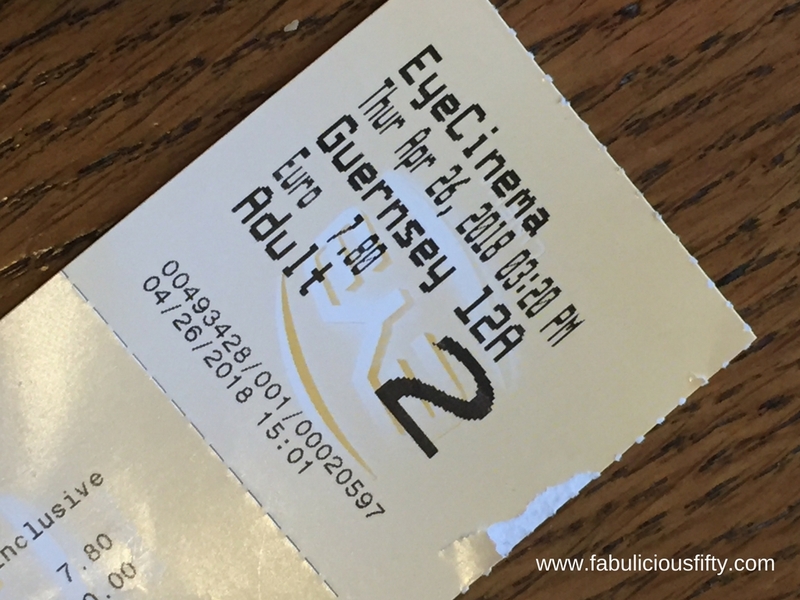 My latest outing was to the Guernsey Literary and Potato Peel Society. I had read the book some time ago and was intrigued to see how it translated onto the big screen. What a delight. A really beautiful representation of a wonderful story line and truly complex characters. As a budding writer I was fascinated by the story within a story. I loved seeing how the story unfolded as each character revealed their part in the establishment of this book club during the Nazi occupation of Guernsey. I won’t add too many spoilers as this is still showing. Modern life is all about multi-tasking. We watch television while checking Facebook. We are constantly juggling tasks and activities. How often though, do we simply do one thing – for a couple of hours? I now consider myself a card-carrying member of the solo cinema club, and a cheerleader too. I’d love to hear your movie recommendations – I know I am going to be indulging again very soon – there is so much good stuff coming up. Thank you so much for reading about my viewing habits. I just put Maudie and Finding Your Feet on my Netflix list. In spite of having heard about an April release date in the USA for Finding Your Feet, I have not seen it anywhere. I’ll get to see it eventually.